Even as Milind Soman went from Ironman to Ultraman, most of us are dreading the thought of taking on our first 5 km or 10 km race or run. It sure seems like a daunting challenge, but one which you can get through by following some time-tested tricks. If it worked for millions before you it will likely work for you too! Relax: First things first; take a chill pill! Getting worked up about your run will just keep you lagging further behind when it comes to preparing for your run. And what do you have to worry about? The running community is one of the most positive and accommodating groups of people you’ll encounter. If you are feeling stressed, then we suggest you simply go out for a run and continue your training without keeping an eye on your finish times etc. Do your homework: Running doesn’t come easy and the idea of some unknown terrain is just going to shoot up your blood pressure and anxiety. So go for a quick inspection of the route for your marathon. Once you determine where you need to push and where you’ll need to cruise, the big day will just seem like one happy race. No shortcuts : Don’t experiment when you are barely a few days from your major run. Stick to what has worked for you in the past – this includes diet, apparel, shoes and hydration techniques. One of the biggest mistakes you can make is changing into a new pair of shoes just before the race. This is likely to make you uncomfortable if you are not familiar with the brand and make already. Your diet should be simple and nutrient rich – but avoid including food that you have never consumed before. This could upset your body’s disposition. Snooze to not lose: Sleep is a key factor in a runner’s life. Remember to get at least 7-8 hours of shut eye because your body needs to prepare, recover and your mind will be much more relaxed on the run. Lack of sleep can hurt your pace, make you cramp up and even cause injuries in distracted moments of the run. Be prepared: The night before your race, pack all your running gear; shorts, vest, arm bands, sipper, bib, and anything else that makes your run incomplete. This running kit will contain everything that makes your run comfortable. Don’t worry about how you look – just ensure that you are comfortable and not in unfamiliar shoes. Organizing your attire just brings you one step closer to the finish line. And it’s always a good idea to pick clothing that will keep you cool after sweating it out. 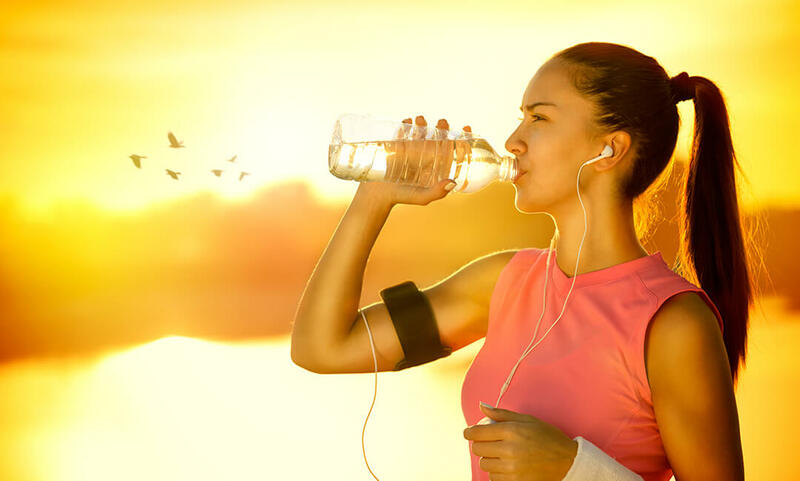 Hydrate: Water is the magic elixir for runners, and the days before the race, keep yourself well hydrated. So much so that your urine should be almost transparent. However, keep in mind that on the day of the race limit your water intake. If it’s a particularly hot day, then you can rinse your mouth and spit the water so your blood pressure is stabilized and you don’t experience cotton mouth. Slow and steady: Run the first few minutes of the race slower than you normally would, with the idea that you’ll finish strong. Don’t overexert your body by hurrying things up as you’ll just burn yourself out. Keep a steady pace so you save your extra energy for the final stretch to the finish. And if you are not meeting your set time targets, don’t get frustrated. The biggest achievement is to finish the race; you can always improve on your time in the next race. Stretch it out: Without a proper stretching cool down post running, you will leave your muscles bearing the brunt for your passion. To fend off stiffness and bring your heart rate to normal, do a 10-minute stretch.